We have long dreamt of creating the UK’s best mattress. 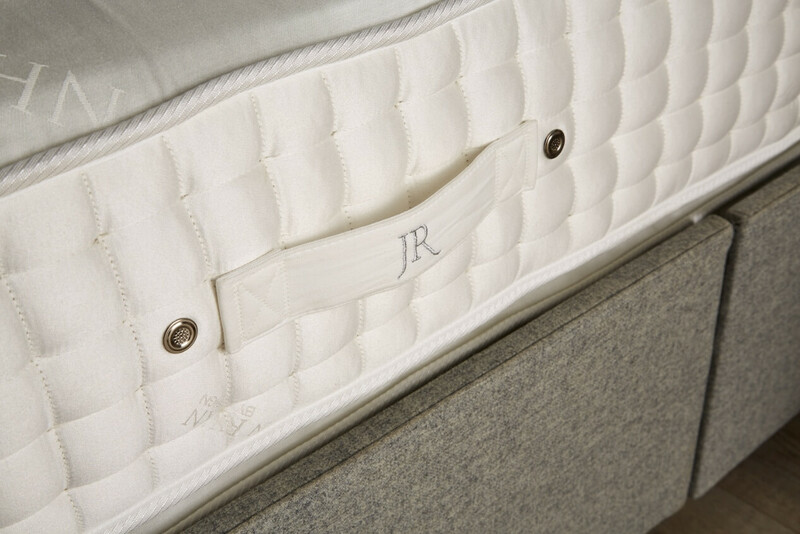 Introducing the John Ryan by Design Legacy sleep system. The ultimate sleep experience. We have sourced fully traceable 100% Natural Fibres. Using British upholstery and heritage handcrafting. Only the best of the British have made it into the Legacy to create the worlds most perfect bed. 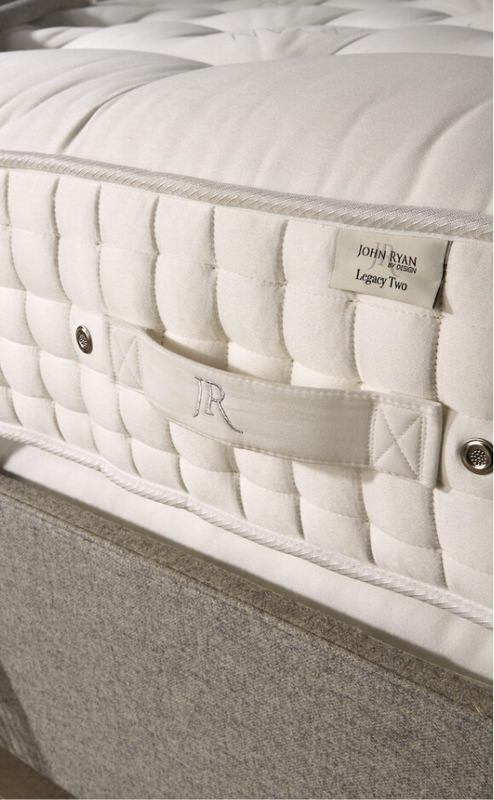 Why are we confident that the John Ryan Legacy as the UK’s finest natural mattress? We have scoured the UK for the best natural fibres available, which are 100% traceable. The bed is then constructed using heritage craftsmanship skills passed on through generations. Every detail has been engineered to provide you with the ultimate comfort. 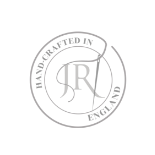 Each bed is Handmade to order using the finest craftsmen, furnished with the highest quality materials. Each one is irresistibly unique. That’s why we believe ‘finest’ is an accurate description of the Legacy mattress. Sourced from independent Alpaca owners in Britain, sheared just once per year. 100% British Swaledale sheep wool; sheared from Gold certification sheep. Revolutionary support which is both breathable and high wicking. Soft, lustrous and flexible Organic Plant Fibre is used in our mattress insulator pad. Vanadium coated pocket springs for independent movement. 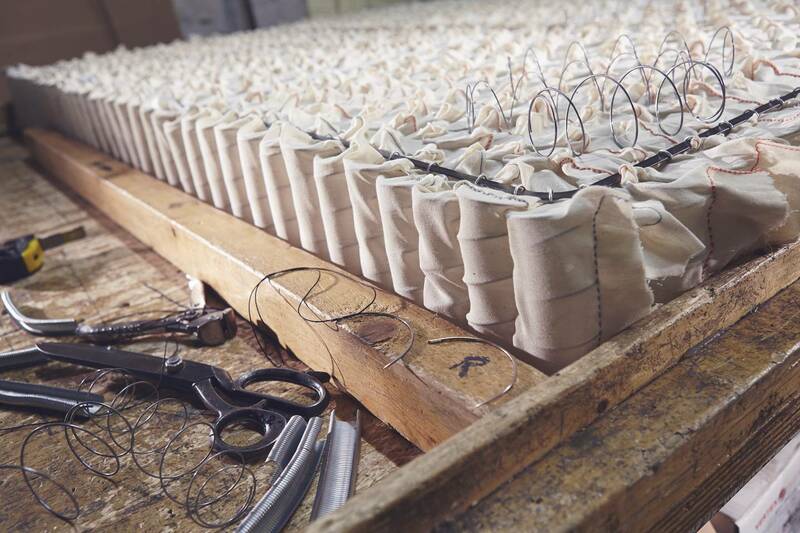 All the support springs used in the Legacy are Vanadium Coated Calico Pocket Springs made in Yorkshire and hand tied. In the Legacy mattress we use 1.4 gauge medium support springs and in the Sprung base we use a 1.6 gauge firm spring. The base pad utilises a smaller 4″ 1.6 gauge firm support spring. Our first of a kind bed frame Base Pad, that sits within the mattress base, features 1300 Vanadium coated calico pocket springs. Similarly to a pocket sprung base this pad adds a more progressive base support layer than a simple sprung divan ever can. Made in Yorkshire and then upholstered with 1200 GSM of Pure English Swaledale wool topped with 1000 GSM of Alpaca Fleece. This provides the first support layer for the Legacy. 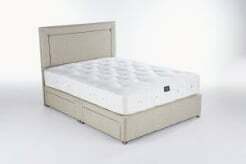 The 1.6 gauge 4″ spring provides the correct amount of support for the sleeper and additional mattress layers which rest on top of it. The Legacy mattress bed frame base is handmade by skilled carpenters from solid wood and has been upholstered in our unique 100% British Wool fabric. The base is made in the heart of Lancashire in one of the original stone textile mills. 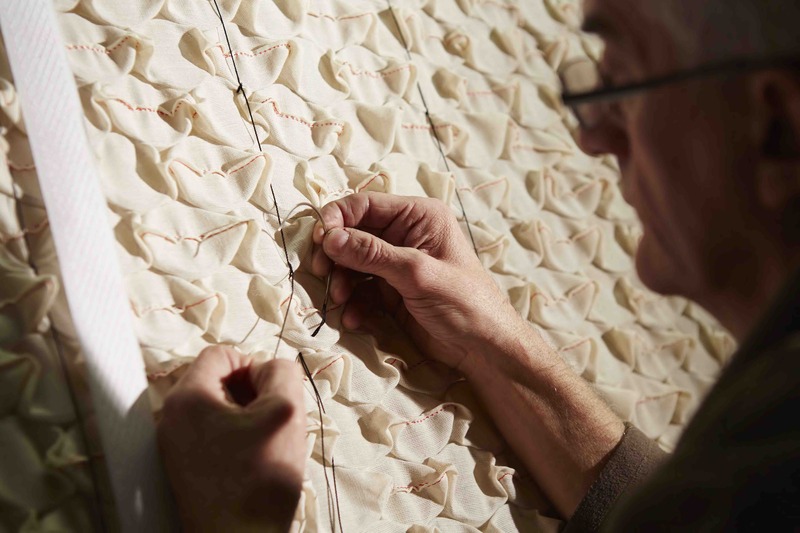 The fabric is woven in Lancashire by a 4th Generation fabric weaver, Mitchel Interflex. They even have their own stream that used to power the mill. It has been blended and woven to our own secret unique specification. It’s 100% natural containing only dip dyed British Wool. Which can’t be found anywhere else. We offer this exquisite base in a choice of either York Stone Grey or Chorley Cream fabrics. The bed frame has a sleek minimal look to it letting the custom-made wool upholstery speak for itself. The mattress base comes in two parts which are locked together underneath by our Teeth-lock system, ensuring no movement. It also removes the need for linking bars. It gives that seamless look to the mattress base with no movement. Fitting into any bedroom decor or stylings whether opulent or minimalist. Traditional castors which are also made here in the UK are recessed to give the mattress base the illusion of floating whilst also allowing ease of movement of the mattress base if needed. Total 2400 GSM. Our 100% British Wool bed frame features 1300 Vanadium Coated Calico pocket springs in a firm 1.6 gauge tension. The sprung edge unit is countersunk into the bed frame itself. Thus removing the height issue often found with raised divans and high GSM mattresses, which can become overwhelmingly high. 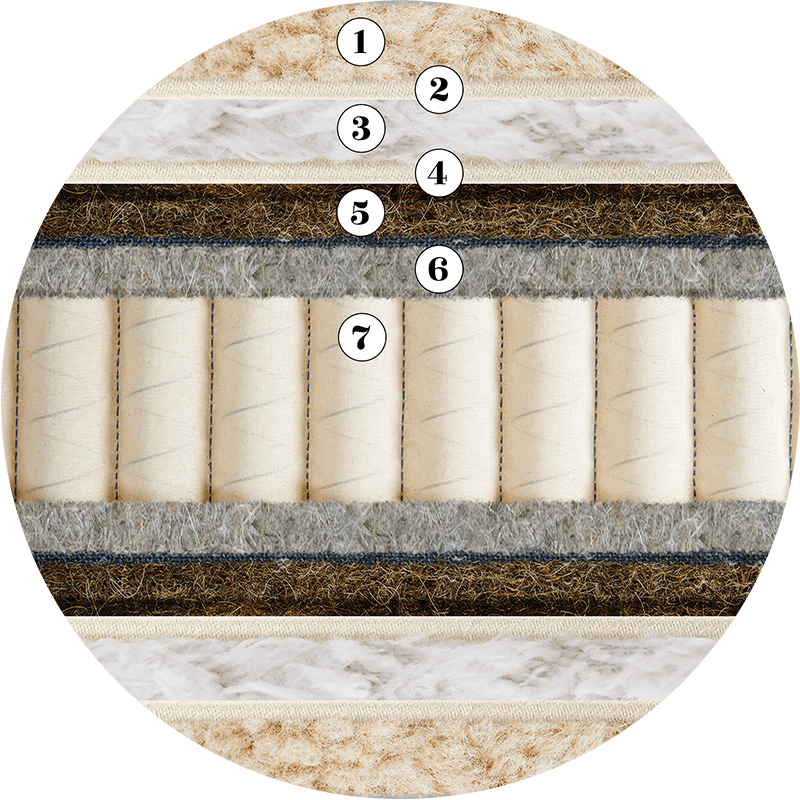 Countersinking allows us to layer multiple natural fibres with significant GSM contents into the mattress without making the overall height unworkable. This base features 1200 GSM Swaledale British Wool from Edward Clay which is then topped with a super soft 1200 GSM of Luxurious Cashmere Wool. 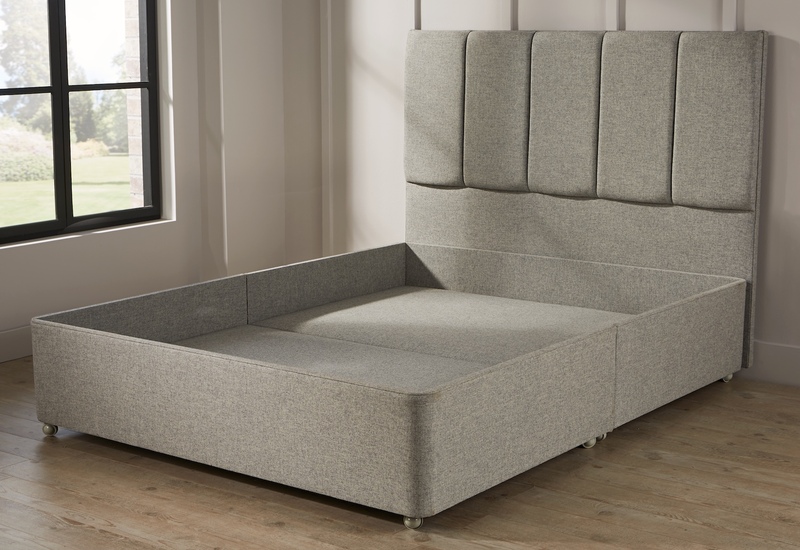 This bed frame is fully upholstered with 100% British Wool woven by Mitchel Interlex to our own specification giving it a luxurious and robust finish. Our unique fabric has a matte finish and is smooth to the touch. Early days for the mattress, but it’s wonderful so far and indulgently thick! Delivery chaps were brilliant – automatically removed their shoes at the door, which was greatly appreciated, especially on a wet night. They were polite, friendly and felt like part of the company. The technical information they give is completely straightforward and accurate and the product is superb. They can only manufacture to this quality and at this price by having no showrooms and no heavy marketing – but that benefits the customer and is reassuring because of their guarantees. You can’t actually go wrong! Following their advice about how to choose a bed based on your individual needs is as good as any “test” you can give a bed in a showroom – which in truth isn’t a good test at all! We are delighted and would recommend John Ryan on both a professional understanding of beds and personal satisfaction. After being given a baffling amount of quackery by various high st shops on mattresses I fortunately stumbled on the John Ryan website which is a treasure trove of straightforward, honest and understandable information. I’ve now had my new mattress for a few weeks and couldn’t more happy with it!